This is a fabulous Veggie Tales DVD. It is released today and if you run over and pick it up at your local Walmart, you will get a free exclusive 24 piece puzzle with your purchase. 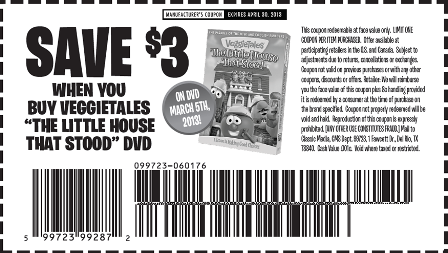 Plus, use this coupon to save $3.00 on your purchase! Veggie Tales is always a hit with preschoolers. Full of funny vegetables that sing, dance, and remind them how much God loves them. This would be a wonderful gift to put in a child's Easter basket this year! As a parent, I want young children learning as much about God as possible. This story is a wonderful way to share good values with your family. We all loved The Little House That Stood! The Little House That Stood: "The Wise Pig Built His House Upon the Rock! When the Three Little Pigs roll into Cabbageville looking to build some new houses, they meet one builder with a plan and two without a clue! Larry builds with hay, Mr. Lunt with bricks, but only Bob builds his houses on a firm foundation - following the wise plans from the Master Builder's Handbook!" Will the Little Piggies make the right choices when it comes to building their houses - and their lives - on solid ground? Find out in this parable that shows kids when they follow God's blueprints, they can stand strong when the storms come!" Plus the DVD also features The Good Egg of Gooseville, a Veggie-style telling of Humpty Dumpty and a great new silly song called Happy Tooth Day! 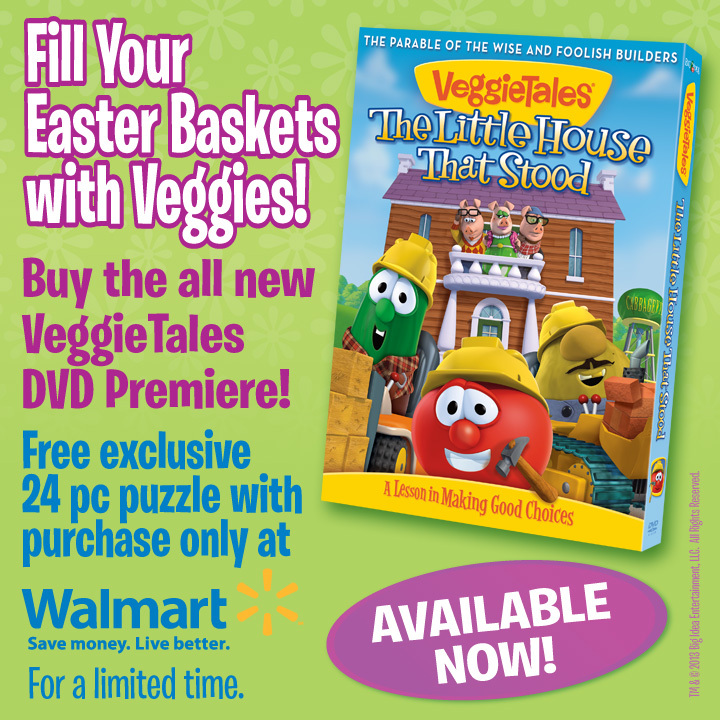 Visit veggietales.com to download a craft project that goes with this DVD, play some fun online games and watch their online videos. Be sure to follow the VeggieTales social media accounts, then enter below to win your very own copy. You must be at least 18 years old and reside in the USA. Giveaway ends at midnight ET on 3/17/2013. Only the first entry is mandatory; bonus entries increase your chances to win. I learned that "God Loves Me" from the daily thought!! I like the games on the site. I love that they always have seasonal items...I always look forward to seeing the veggie tales christmas nativity scene each year for sale! The games and coloring pages. I love the Princess and the Popstar dvd! The kids like the games on the site. i like all the videos for kiddos! I like that there's games on the site. My son loves Veggie Tales! I like the coloring pages for the little one! I like that they have online games for the kids to play. This is my grandsons favorite show. I like the Bob and Larry quote of the day and the fact that this is a show you can let your children watch without previewing. They have games...that's the best! I learned that it is a place where children can have fun, faith-based web interaction with music, games, video and their favorite Veggie characters! I have always been a fan of the faith based learning that veggie tales provides. I like the web interaction!